This book came to me as a gift. 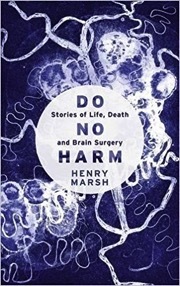 It comprises a string of stories from the long and distinguished career of a London neurosurgeon. Some are happy, some are not, but they are well written and all sound honest. His stories are made more poignant as he reveals his own reactions to becoming a patient himself. And helping to look after his mother dying of untreatable cancer leads him to meditate on what is a good death. 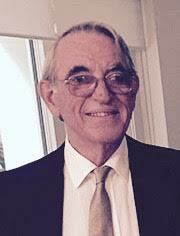 My heart was warmed by his responses to the insidious creep of bureaucracy – ‘in the old days you just went on working until the work was done.’ Decisions made by bureaucrats with zero clinical experience, supposedly in the interests of improved patient care or safety, that did little but frustrate the clinician interested in patient outcomes and welfare. He describes his attendance at a Mandatory and Statutory Training (MAST) Catch-up Seminar (where he was made to feel guilty for ducking out during the morning tea break in order to sort out a medical crisis) as, ‘listening to a young man with a background in catering telling me that I should develop empathy, keep focused and stay calm.’ And there was the European Working Time Directive (EWTD) compliance manager sent to enforce a new law that no junior staff worked more than 48 hours per week. Made me wonder whether Britain under Brexit was not better off without the faceless, unelected bureaucrats of Brussels. 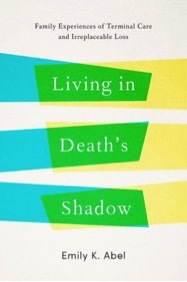 Warmly recommended bedtime reading for anybody who works in palliative care. This book is based on 105 narratives by family members of people with serious and terminal illness that appeared between 1970 and 2014. Compared to patient-written narratives, we are told that little attention has been paid to the memoirs of family members. The book also provides some interesting historical perspectives. As it happened, there were two separate developments originating in the 1950s and 1960s that have affected, in contradictory ways, the manner in which we die – the rise and dominance of intensive care units and the movement to humanize the care of the dying. This is a scholarly but readable assessment and analysis of the memoirs of members of the families of people with serious and terminal illness, but Abel admits they were overwhelmingly white, well educated, and relatively prosperous. That left me wondering about the silent majority – I wondered what we might have learned if some of the questions addressed in this book were put to a few hundred consecutive, unselected people attending a major cancer clinic. In this book, the problems of palliative care are described from a slightly different angle (that of the relatives and carers), and I think most people who work in palliative care will find it a worthwhile read. Emily Abel is emeritus professor at the UCLA-Fielding School of Public Health in Los Angeles, but nowhere was I able to determine whether her background was in medicine, nursing, psychology, sociology, or what. 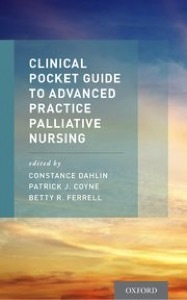 This book is the pocket-sized, clinically practical companion to the textbook, Advanced Practice Palliative Nursing that was reviewed in the August Newsletter. There are chapters on pain, dyspnea, bowel symptoms, a variety of other challenging physical symptoms; anxiety, delirium, depression and palliative care emergencies. There were interesting (and useful) chapters on the discontinuation of life-sustaining therapies, and the withdrawal of cardiac and respiratory technology. I worried about the chapter on palliative sedation, for which there are no agreed definitions or terminology (see Sterckx et al Continuous Sedation at the End of Life – reviewed in the July Newsletter). The last two chapters are about pediatric and geriatric palliative care. In the chapter on pain, it states that a wide array of opioid drugs is available if one drug is ineffective or produces unwanted side effects, but it provides only a few lines about just three of them. The chapter on anxiety was appropriately more detailed. I found the chapter on depression difficult, because it tows the North American party line that insists on the medicalization of all psychological symptoms in all people who are dying or grieving. The chapter on palliative sedation mentions that some people disagree with it because it might be used to hasten death, i.e. euthanasia. But It doesn’t discuss whether that might already be happening in America, as has happened in The Netherlands where it is reported that the intention of hastening of death was the prime motivation in 50 percent of cases in which palliative sedation was used (see Griffiths et al Euthanasia and Law in Europe – reviewed in the March 2010 Newsletter). Are there grounds for believing the situation is any different in America, or Australia? I liked this book. Good ideas and much less waffle. Lots of tables and lots of lists, which I like. But in some chapters, I thought there was insufficient clinical detail ­­– not enough meat on the bone. This book needs to include all the practical information needed by APRNs (Advanced Practice Registered Nurses) at the bedside in the hospital, or the home, or the nursing home, or the hospice. If that were the case, it would go into the excellent class and be useful not only to American APRNs but also to advanced nurses/nurse practitioners elsewhere. 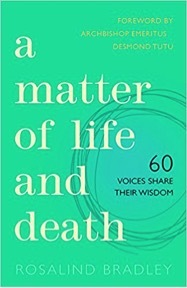 This is a compilation of inspiring verses, images and reflections drawn from a wide range of individuals about the nature and meaning of death and our response to it. Who is it for? Bradley says it is ‘intended for those who are ageing, those suffering from a terminal illness ..., those who care for the sick and dying, and those trying to make sense of life and death.’ I could make an argument that it is for everyone. I have no doubt that this book will provide some comfort and support to those with serious or terminal illness and the people who care for them. For those who work in palliative care, it provides something to dip into, perhaps helping your own reflections about what you do. Above all, I liked the brevity. Few of the contributions were more than a couple of pages, which allowed you to read them and then sit back and reflect. This is one rabbi’s reflections on being diagnosed with and treated for malignant lymphoma. The apparent chaotic disorganization during the diagnostic phase and leading up to his first treatment is probably attributable to his shock and perhaps a touch of exaggeration. 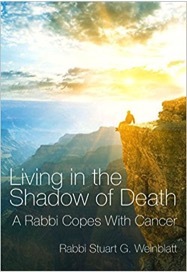 Very little is said about the rigors of chemotherapy and this book is primarily about his spiritual and philosophical insights and how they might help others. It includes several sermons to his congregation and there are many stories and parables from the Jewish tradition. For patients or caregivers in a similar situation, some would find solace and support in this book, whether they were Jewish or not. For healthcare professionals, it is another unique account of the traumas our patients endure. 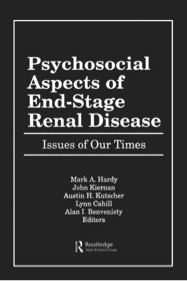 This is a collection of articles covering many of the psychosocial aspects of end-stage renal disease (ERSD), ultimately sponsored by The Foundation of Thanatology in New York. It covers an impressive range of subjects, although I would question the value of publishing some of it (e.g. the inconclusive uncontrolled study [n=7] of marriage fidelity in ESRD). My real complaint about this book is that the material is 25 years old, having been published in Loss, Grief & Care, Volume 5, Numbers 1/2 1991. I find it hard to believe there have not been significant advances in some of the problems discussed in this book. I would have been interested to hear what is the current approach to the paradox of post-transplant depression and noncompliance.